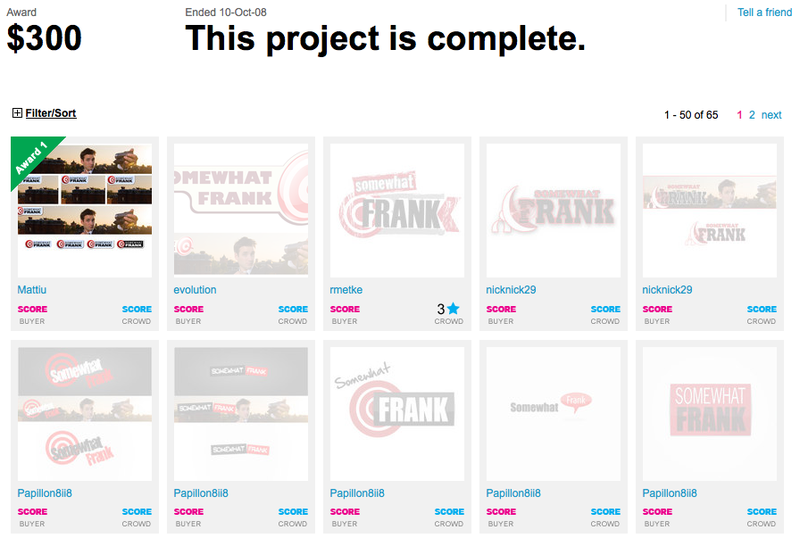 Though I know lots of designers I decided to give Crowdspring a try. Why did I go with CrowdSpring? For a couple reasons, first I wanted to see what type of response I could get from the design community on CrowdSpring. Secondly, while I know a lot of designers I felt selecting just one designer closed off my creative options as I probably would have gotten a few of designs to choose from. If I did not like the designs I received I would be stuck the awkward position of having to let the designer know my displeasure. Since most likely the design would also be a friend of mine I opted to not put personal relationships at risk. So I submit a detailed proposal for SOMEWHAT FRANK setting my price at $300 for a new logo design. I got my first proposal within just a few hours and by the time my seven days project was closed I was pleasantly surprised to have receive 65 different logo design options to choose from! Check out some the designs in the screen-shot below or check this link to see all of them. The CrowdSpring community of users voted for the designs that they liked and I also got to vote and give feedback throughout the entire process. This feedback worked out great as I had at least a dozen designer spinning out tweaks to several different logo options during the process. After seven days, I finally decided on a winning design (which is the one I am currently using). Overall, I was extremely pleased with CrowdSpring. It was easy to use and I got a lot of great designers. The designer I finally selected to go with also was super to work with and went above and beyond my expectations. I would definitely recommend using CrowdSpring and would use it myself again. If you are looking for a logo, website or other design related project you might want to check out CrowdSpring. I hope you like the cleaned up SOMEWHAT FRANK design. I have added a new lifestream page that shows off all my recent online activity. I also added a SOMEWHAT FRANK Shiny Objects shop that showcases some of the products, gadgets, books and other items recommend or like. I hope you find something you like too. Additionally, I added a live video stream page which showcases my Flixwagon, Qik, BlogTV and UStream live video players. I hope you like it. I do.